The Largest Museum in MalaysiaMuzium Negeri Terengganu is located in Bukit Losong, Kuala Terengganu and houses the State’s historical artifacts and artworks that are centuries old. On display are Terengganu’s and Malaysia’s rich and colourful heritage. The museum covers an area of 1.7 hectares. At the main entrance is the original Batu Bersurat of Terengganu, displayed to inform visitors that Islam was officially embraced as early as 1303 AD. 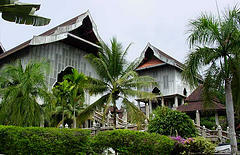 In the museum compound, Terengganu old palaces, traditional houses and boats are prominently displayed.